It was really fun. I got to do a lot. The design was most fun. Data taking least fun. Even though it was kind of fun, it was frustrating because we had to change our design to make it better. I like working as a group and I also like making and building things even though we had some trouble. I really liked working as a group and building the zip line. Mass trials had interesting results and allowed us to learn from them. I’m originally not interested in science stuff, but a zip line sounded a little bit interesting. I got to see how inertia, friction and other forces work in real life rather than pictures. I’m not really into design but it was pretty fun and interesting. It was helpful to have other references such as readings and the science games we played at class. It was fascinating how science can be linked to the most random things. I’ve never been really interested about zip lines but I think it was pretty cool that we got to build our own zip lines and test them with eggs. The zip line project helped me learn concepts of force and motion because it was a model that provided evidence for the things we learned in class. It was kind of boring testing over and over again, but when we got what we wanted, I was pleased. My interest level was so-so because it was very hard and it’s really hard to get 5 seconds. The zip line didn’t really seem to connect with force and motion. While getting the zip line done was OK, it took long and every time we came back we had to redo the entire thing because we couldn’t leave it as it was at the end of the day. Give a little more instruction. Give more “short” discussions in class to understand more. More different things to do. My interest level was low because the same procedure was repeated again and again. I wasn’t committed as I didn’t think the project was applying, it took a while. Make it more interesting by giving groups different times to match or different materials. More time. More reminders. More instructions. It was rather challenging and repetitive. We should have worked more with varying mass. My group spent too much time on designing the zip line that we didn’t really think about force and motion. Kick-off: Students returned from winter break with an immediate design challenge: In 25 minutes, how close to 4 seconds can you make a “passenger” travel your zip line? A lot of energy filled the room as students worked within a time constraint. By the end of class, groups had zip lines working and most were within a half second or so of the 4 second requirement. We then took a few days getting a feel of motion by walking graphs linked to Vernier Go!Motion detectors. Students got a kick out of matching graphs and I was impressed with their ability to begin describing relationships between position-v-time graphs and velocity-v-time graphs. Being able to connect their movements to these graphs is extremely helpful and a point that I need to continue returning to as I work with students. 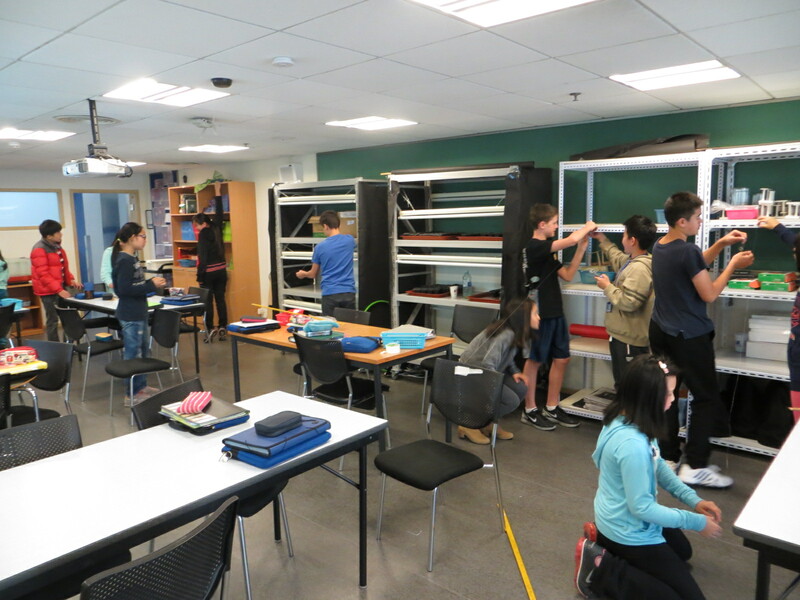 We then shifted back to zip lines and students began working on a project to design/build/test a zip line and harness that would carry an egg approximately 3 meters in 5 seconds. I struggle with finding that balance between being deliberate regarding discussion of ideas and giving students adequate time to tinker, problem solve, fail and continue. This time, I experimented with small group mini-lessons. Breaking the class into thirds (both students and time), I took one group of students to have conversations about specific topics such as inertia. The pros – I had small groups of students. This allowed more space for each student to have a voice. Conversations started between students and I could help with questions that arose and students felt as if they had my complete attention (they did!). In general, I found that it was nice to be able to gauge student understanding and shift conversations with small groups as necessary. The cons – Wow! That was repetitive! Before, I might have done the same mini-lesson once per class and now I tripled the number of times talking about the same topic. In addition, I had to trust that students were moving their project forward and independently making progress. Another student wrote, “Give more “short” discussions in class to understand more.” and this sentiment was echoed by a few others. I take it to mean that they appreciated the time and is a technique to continue experimenting with in the future. My students need a lot of work on procedures and this was evident as multiple drafts were written and the frustration rose in both the students and myself. They need more help in looking towards the end point and realizing the type of data to collect. There was a common groan as groups realized that creating a position vs time graph required more data points than the end of the zip line. Looking forward, I plan to use procedures from this unit as models that we can learn from and improve on. A student wrote that, “Even though it was kind of fun, it was frustrating because we had to change our design to make it better.” This is an area that I was pleasantly surprised with at the end. 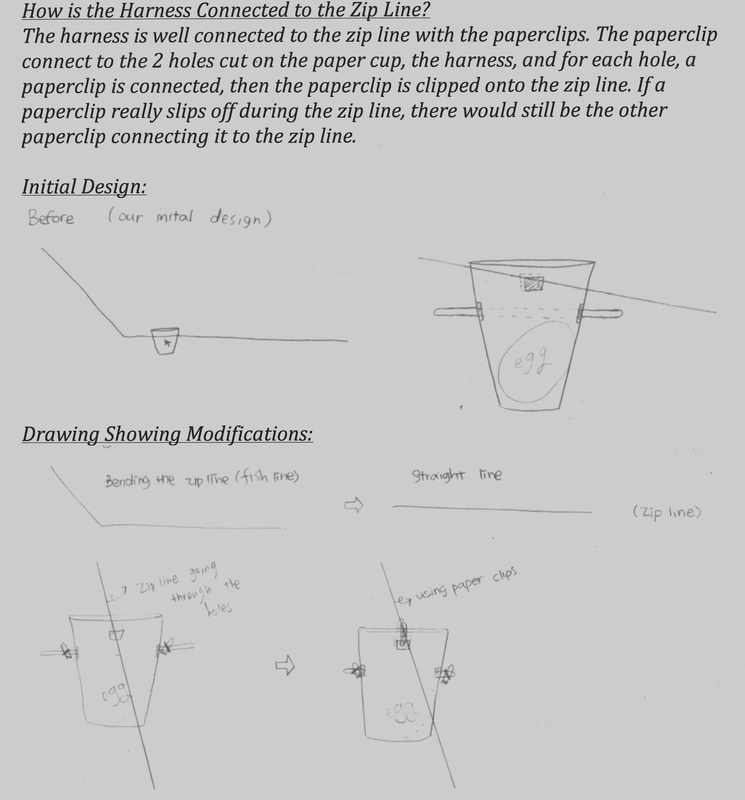 I encouraged students to make multiple drafts of their designs with the idea that testing and close observation would allow them to find weaknesses they could improve upon. However, I was not deliberate about it. Towards the end of project, I attended a great workshop at the Taipei American School regarding engineering in the classroom. A teacher described that she has stops in her class. Work comes to a halt and current design ideas are documented. This is something that I will “steal” with thanks in the future. During the workshop, it was also mentioned that at the beginning of a design process, students in groups are scattered across the room. The purpose is to give each student a start so that they are individually committed and come forth with their own ideas. By chance, I did this with one of my classes and the results were much better. Groups began with three or four ideas to merge into a new design. I also realized that some students are quite skilled at making diagrams of design ideas though most are not. I’m flagging this need for a back-to-school start next year. Make processes such as diagramming critical to the classroom at the beginning of the year! Force and motion provides a good avenue to discuss concepts of stability and change. We discussed. But, not much else was done. This is an area that I would love to receive more guidance on. What are good tools, methods, and ideas to strongly connect students to these core concepts? During the middle of the project, I hit a bit of a wall. I felt that students were not making enough progress and that too much was simply not working well. Then, I had a long weekend at the conference at TAS. A weekend talking about the design process in schools recharged my batteries and I returned ready for a new look. Project pieces were coming together and students were making strong connections to force and motion concepts. I do think that I need to be more deliberate in how the three strands are brought together. Mini-lessons were provided on concepts at a bit of expense on writing procedures and designing data tables. The procedural components fell more to revisions on a page and short conversations. Is that enough? I’m not sure at the moment. It was a first time physically writing down the three (content, cross-cutting, practice) goals at the top of my unit plan and that made a positive direction. We made progress in tackling an engineering challenge through design while also expanding our content base. I’m encouraged while also wanting to find a way to get more feedback from others also working in this direction. This entry was posted in NGSS and tagged NGSS, Reflection by Frank McGowan. Bookmark the permalink. First, thank you for sharing – your reflection is incredible – the feedback collected from your students is extremely valuable – so much insight in what they gave you. My favorite piece of this blog is the bit about what you took away in terms of interaction with your kids – “The voices of quieter students were heard and I was able to better connect with each student.” This is extremely powerful. The kids had voice when designing and redesigning, but also in their own reflection at the end when they told you how well they were able to connect it to the content. Many of my students share that same frustration expressed by some of yours when they are asked to redesign or make modifications. There is a “it’s good enough” mentality that I strive to break, and some kids push back because they perceive it as failure and they just can’t deal with that. I love the idea of mini-lessons – chunking the info to suit the need for the next “checkpoint” – building in places to regroup and evaluate progress is powerful – maybe that will keep some of your more discouraged kiddos from feeling they got all the way to the end and then had to start over – they get feedback on something more specific or can make adjustments quicker because they connect it to their mini-lesson content sooner. In terms of the cross-cutting concepts, this is, by far, my biggest challenge in my lessons as well. I, too, am looking for resources. It may sound like passing the buck, but I’m wondering this: as students engage in more NGSS through their foundational years in elementary and middle, those CCC’s will have a whole lot more meaning – they’ll see them woven throughout the content all the way up – not just as an isolated thing we can identify in some lessons now that we are older, and that will make for much richer discussion and deeper connections to previous learning. Thanks for all of your feedback, Melissa. Over the weekend, I tried to put together my first aquaponics set-up and must have gone through a dozen designs yet found myself forgetting to stop and record (hoping to find a future model for students). As I worked, I thought more about the need to insert pauses into the flow of the classroom. My design process was more like the bandaid approach. Try something – give a little fix – try again – and so forth. I bet many students are that way again and I need to slow them down, have them question their process and look at the whole system. Fun times! I like it. Looks like a great plan. I like the redesign process and multiple models that are involved. Thanks, Patrick. I think that I have a few more redesigns on the unit as well 🙂 It’s great to listen to student voices.